When Yamaha launched the Ray last year, they raised quite a few eyebrows. A Japanese manufacturer known primarily for its performance oriented products suddenly wanted to jump into a segment that it was never associated with, in India at least. But true to its virtues, the Ray did prove its credentials as a worthy competitor to the established. And now Yamaha India has us startled once again - they've just launched the Ray Z, a jazzier looking version of the Ray, targeting the male scooter buyer this time. We got a chance to straddle the scooter for a quick spin at the launch, and here's what we think of it. The Ray Z is identical to the Ray mechanically. Contrary to our expectations the Ray Z does not get a bigger, more powerful engine and uses the same peppy 113cc engine seen on the Ray. However, Yamaha did use the opportunity to give the engine an update, and the Ray will get these updates as well. The air-cooled, 113cc engine that produces a maximum of 7.1PS and 8.1Nm now gets roller type rocker arms and low friction oil seals to reduce frictional losses and improve efficiency. The Ray Z also gets a throttle position sensor to optimise ignition timing. Apart from these the chassis and suspensions have been tweaked as well. 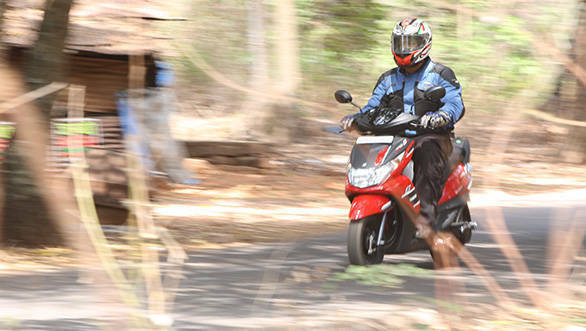 These however are minor changes, and do not alter the scooter's performance or dynamics in a big way. Yamaha though claim the scooter is comfortable and easy to manoeuvre even with two on board thanks to the updates to the chassis and the suspension. 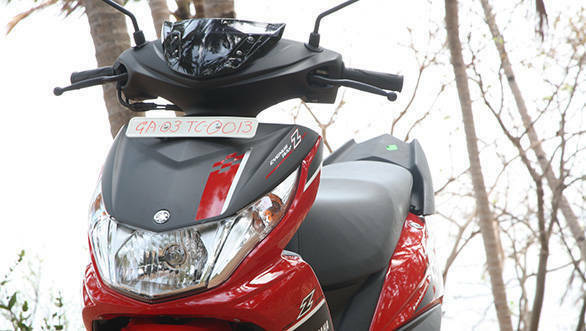 The biggest change to the Ray Z are the sporty graphics which differentiate it from the Ray. As opposed to the Ray's solid, plain paint schemes the Ray Z gets two-tone paint jobs with snazzy looking, chequered flag inspired graphics. These are the only visual distinction though, as the body panels remain the same as the Ray. The Ray Z also gets a tiny flyscreen upfront, but this again is purely cosmetic. That said, Yamaha India has done a neat job as the Ray Z looks appealing, especially in the black and red colours that we got to ride. The matte black front apron with the chequered flag looks nice with the glossy red of the body panels. It also gets a 'Z' badge on either side. The grab rail at the rear is different as well, and uses a sharper design as compared to the Ray to give it a sportier appearance. The clocks get a carbon fibre look as well while the rear suspension springs are now painted red for a sporty look. We were impressed with the dynamics of the Ray, and the Ray Z being identical feels as impressive. It has a confident feel to it even when going fast, and its dimunitive dimensions give the Ray Z a sense of nimbleness. 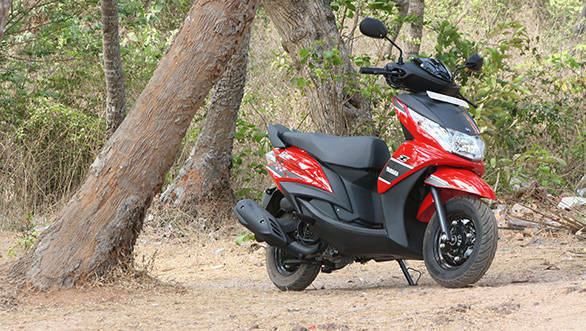 This, coupled with the peppy performance from the engine should make the Ray Z an ideal choice for scooting around town. The brakes as we've said before could do with some more bite, and in fact we expected Yamaha to offer a front disc brake as an option at least. The Yamaha Ray as we said in our tests is an able scooter and even won OVERDRIVE's scooter of the year award this year. The Ray Z thus should make for a great choice for youngsters keen on buying a smart looking, fun to ride automatic scooter. 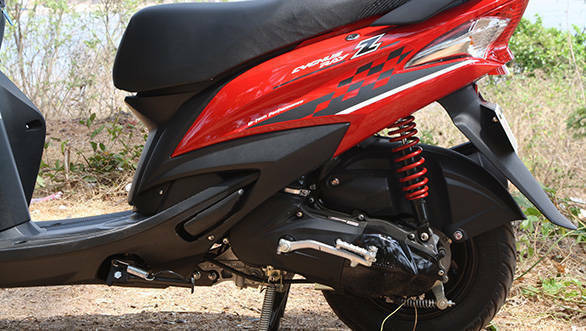 The Ray Z is priced competitively at Rs 48,555 ex-showroom which makes it an ideal choice given the package it offers.